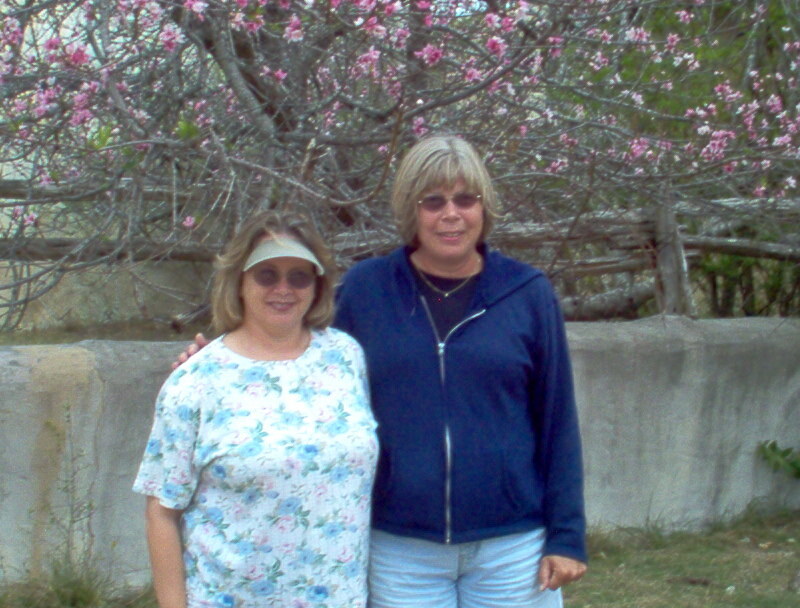 As we were getting ready to leave Rainbow Plantation, a fellow blogger, Susan, stopped by to meet us. She and I have been following each other's blogs for several months and we are so glad she stopped to introduce herself. We got to meet her husband, Jack, as well. Meeting up with fellow fulltimers you read about on the web is one of the perks of traveling like we do. Eventually we said our goodbyes and we were on our way. We headed out toward I-10 to make the lower Alabama RV.net rally in Dothan. 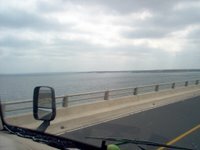 We crossed Escambia Bay around Pensacola around noon. 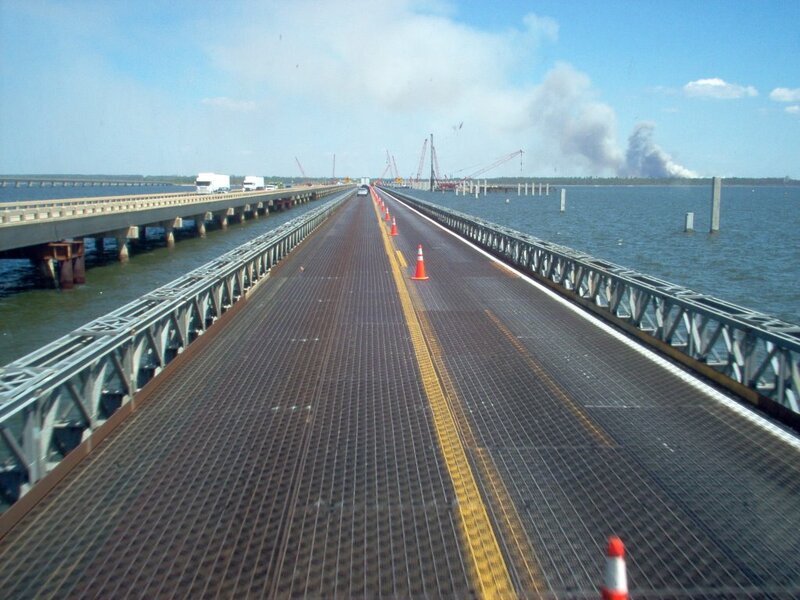 This bridge was taken out during Hurricane Ivan, I think, and the last time we were here, parts were missing. We were on the side that got hit and they just had open grating down, so it was a little nerve racking. From the bridge we could see smoke and knew they were having wildfires in Florida, but we just crossed the bridge by about a couple miles and they closed the interstate in front of us. It was I-10. 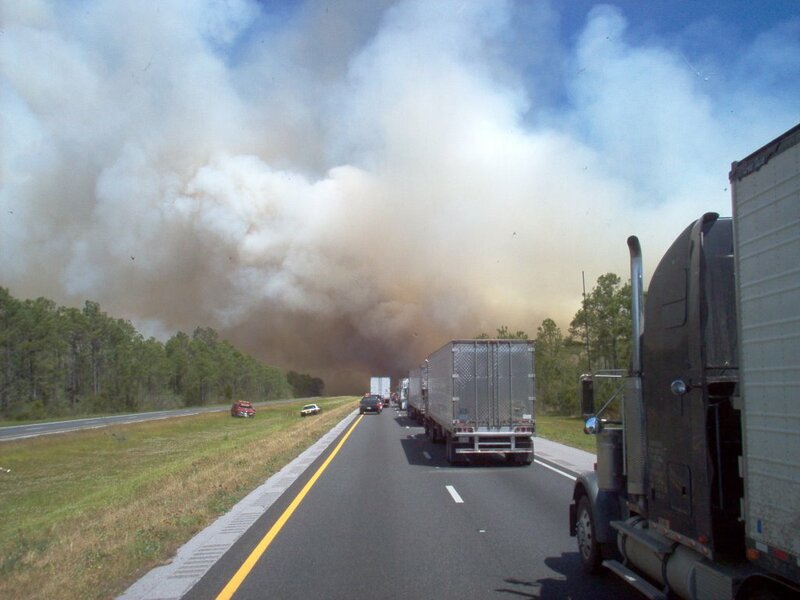 We were about 1/4 mile from where the fire was working toward the interstate and we had a few anxious moments. The cops were letting people turn around in the median, but in Florida they don't have any crossovers. I got out and was talking to some of the truck drivers and they recommended at our weight, we not try turning in the median. As luck would have it, we could see back behind us many trucks had made the turn, but one was now stuck. It was a car hauler. The one trucker was really nice. . . he was right beside us and he asked if we had to be anywhere. I said, "Nope, we are good to stay." He said that's what he was doing because he was too heavy to go through the median. Eventually all of the car and small truck traffic in front of us turned, but we stayed where we were. After about an hour, the smoke started to thin, and they started letting traffic go through. So we got through and we passed by the fire. It didn't look like a forest fire, but looked like a grass fire, although it had at one point leaped across the road and burned on the other side too. We arrived in Dothan at the Peanut Festival Grounds and set up camp. Got to meet up with Mark and Patsie (2stepr) Not sure how he spells it. Our rally here starts tomorrow. We left Gary and Jo's yesterday morning and arrived at Rainbow Plantation in Summerdale, Alabama, around 2 p.m. Set up camp and wandered into Foley, Alabama, to the outlet stores. Did a little shopping and found a pair of shoes. This morning we headed west to Fairhope for Terry to get his blood work done. We had no trouble locating the LabCorp and he was the only one in there, so he was out very quickly. We drove around Fairhope which is a quaint little town. They have a downtown area and we saw NO stores boarded up out of business. There apparently is a push by Wal-Mart to open a store in Fairhope and people are divided as to whether it should be permitted. We saw "Welcome Wal-Mart" and "Say NO to Wal-Mart" signs all over. When we returned to the camp, we washed the motorhome. . . big, big job. Makes we wish we had a van-camper. Hah. We also washed the little car. Hosed down the awning mats and now everything is ready to go tomorrow. 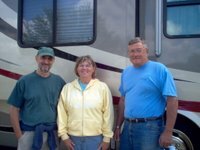 We are breaking camp around 9 a.m. tomorrow and heading for the Peanut Festival Grounds in Dothan, Alabama, to the Lower Alabama RV.net rally. Yay. Rally Time. On the go with Gary and Jo! We are in Zachary, Louisiana, at cousin Gary and wife Jo's. We arrived Saturday and set up camp in their back yard. They have 40 acres, I think he said. Since we were here last fall, Gary wired us a 50 amp plug. How's that for service? So plugging in is a breeze. Gary is a charter fishing captain who hasn't fished since Katrina wiped out the fishing camp, but things are slowing getting back to normal down in Leeville, about 20 miles from Grand Isle, Louisiana. Part of the state park at Grand Isle is open. . . there is no longer any beachfront camping and I think the bathhouses were destroyed. I believe a lot of people have left the island for good now, but they did have their own school system and Gary is not sure if the school is running yet or if the students have been relocated. I would like to go see it right now, but we are heading to a rally is Alabama next weekend, so we won't make it this year. Yesterday we went to the park here in Zachary for a reenactment. We have been to a few in the past, but this one was different and it was quite large. We got to see some demonstrations and visited with a lot of the reenactors. They are really quite passionate about portraying history and most are very well versed about the role of the various companies in the battles. Today Jo has to go to work :-( so we will probably hang out with Gary and get our mail. We will leave here tomorrow (if the mail comes today) and head toward the Alabama rally. Yes, that's right. . . we are at another casino. . . heh, heh, heh. Left Beaumont yesterday and drove about 100 miles to Kinder, Louisiana. 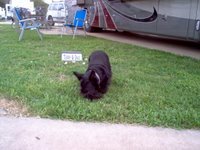 We are camped at the RV Resort at the Coushatta Indian Casino just north of town. The campgrounds affiliated with casinos are for the most part very nice. They are spacious, full hookups with all the amenities, nice facilities and usually a very good value. They hope, of course, that you will go spend all your money at the casino. But that doesn't happen with us. We set up camp yesterday around noon and just hung around here, getting a walk in and letting the dogs out to get some air. The only problem has been the weather. WHERE IS THIS COLD COMING FROM? Ever since we left Victoria, the weather has turned cold. Had to have the furnaces on. Last night we put the boyz in the bathroom, so we only had to run one furnace. They don't mind. It's nice and cozy that way. It did rain yesterday too, which made it cold and wet, but we have seen so little rain, we weren't really upset about it. Today dawned cold again, but not wet. Even the grass was dry when we got up. We had breakfast and took our time getting ready to go to the casino. We left just before lunch. We spent several hours there. We didn't win too much. In fact, we were in danger of losing our entire $20 we allot ourselves, so we decided to take in their buffet. After dinner, we hit some machines on the way out; and, as luck would have it, Terry had a hot machine. He won back $20, so it was about a break even day. I figure we had about 4 hours of free (or near free) entertainment. Not bad. We will be here till Saturday then we are going to travel to Zachary, Louisiana, and drop in on Terry's cousin, Gary and his wife Jo. We saw them in the fall and will stop for a night or two to say hello. While we were in Victoria we took time to do a little siteseeing. 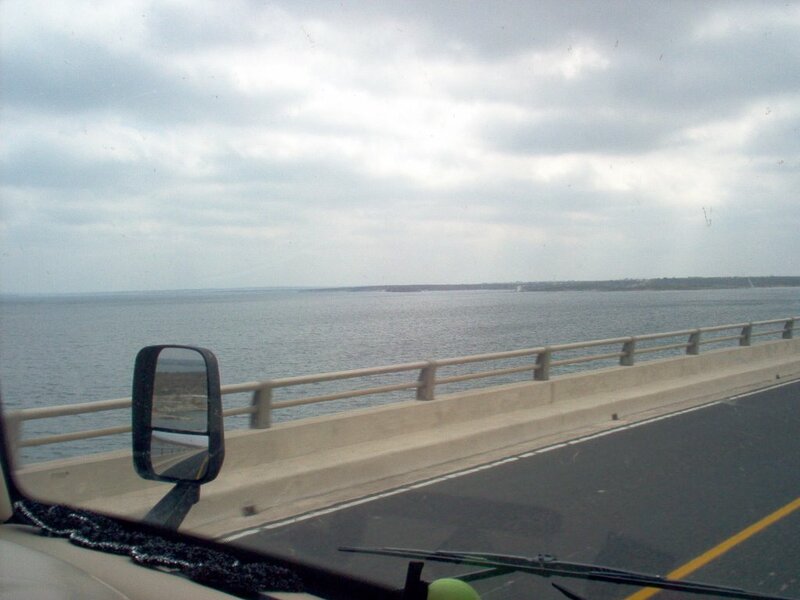 We drove down to Port Lavaca one afternoon. We got to see the ocean and we weren't disappointed. We drove out to Magnolia Beach and found several RVers boondocking on the beach. Most of them were Canadians. Boondocking on the beach really intrigues us, but we aren't quite sure about the salt spray on the coach. Don't want to purposely subject it to corrosive materials. 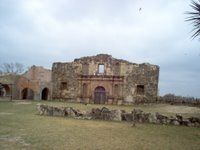 Yesterday we drove over to Goliad which was the site of a massacre of Texas Revolutionary militia under the command of Fannin by Santa Anna. We visited a mission and then the presidio, where the doomed prisoners were kept. The entire presidio has been reconstructed to appear as it was in the 1800's. It is quite impressive and the church is beautifully restored. This morning we left Victoria at 9 a.m. We headed toward Houston and arrived there around 11. We chose to take the toll road around Houston which turned out to be a good choice. Total cost was $15.75, but the piece of mind with Terry driving was worth it. He doesn't normally drive the big cities, but he was at the wheel and decided to stick with it. The toll road was not heavily traveled and we got around Houston easier than Indy. 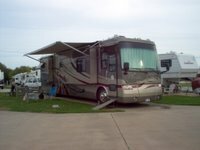 We are in the Gulf Coast RV Resort at Beaumont, Texas. Tomorrow we head toward Kinder where we have reservations in the casino campground. We enjoyed our stay in San Antonio. We met up Janice and Dean (luv2cruise) and the six of us had a great time there. Janice fixed red beans with rice and sausage one night. Patti and I added a salad and cake, so we really enjoyed a feast. One of the greatest things about full timing is the friends you make along the way. Mickey and Patti, Janice and Dean are good examples. We never knew them before, but now we share this great lifestyle and we meet up periodically and do things together. One day I took Janice and Dean and Patti and drove the Mission Trail. 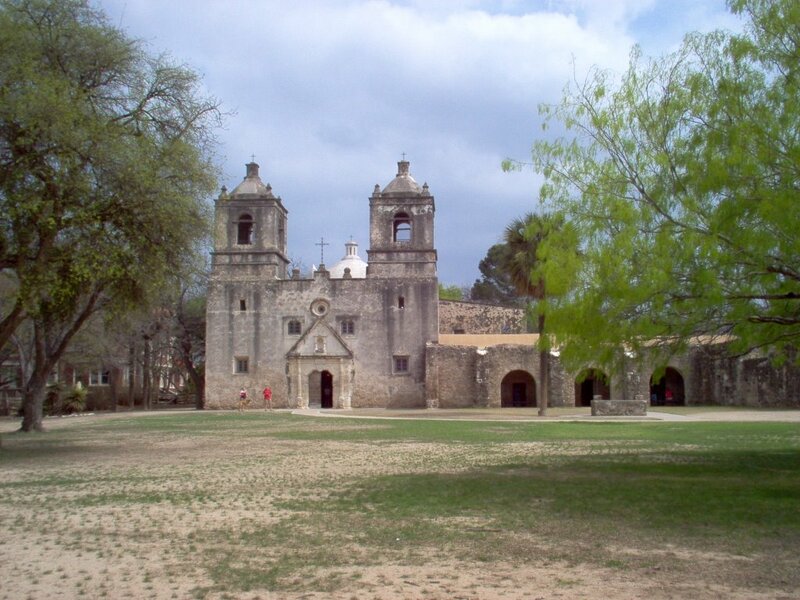 This is the site along the San Antonio River at which these missions were built. It extends for several miles. There are five including the Alamo. They are located south of the city proper and are in various stages of restoration. All four of the churches are quite impressive and masses are held regularly. You can also book them for baptisms and weddings, etc. 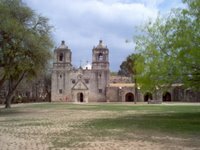 The missions all were built as compounds with walls, quarters, granaries, etc. They are definitely worth a visit. They are not generally crowded. It is one of the most impressive and inspirational visits I have made to an "attraction" and it is free. It is not a tourist trap, but remnants of life long ago. We left San Antonio this morning and arrived in Victoria, Texas, around noon. We had planned on going to Corpus Christi, but our experience with spring breakers in San Antonio convinced us we didn't want to chance running into crowds out on the Gulf.We plan to be here until Monday when we should get our mail. Really good Mexican music. . . and the food. . . wow, the food smelled so good. But we were raisin to raisin walking through the area. We did stop at most of the shops and did a lot of browsing. There were so many people. When we left there, we drove toward the camp and found a barbecue place to eat at. It was very good and we enjoyed a good meal. 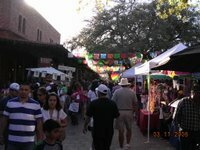 I didn't take my camera with me this time, but because I had been to the Mercado twice before and had pictures. But I should have. Patti was smarter than me, so maybe I can pilfer some pix off her blog. We arrived in San Antonio yesterday in the early afternoon. Janice and Dean (luv2cruise) were here waiting on us. We had reservations for a week at a campground and to say the proprietors had lied about ALL the amenities there would be an understatement. She said they had pull throughs, 50 amp hookups, big rig spots, etc. We tried 3 different spots before we finally settled on one and then could only put 2 of our 4 slides out. We can still negotiate in the coach, but I was NOT a happy camper. We all just paid for 1 night and morning could not come quickly enough. Before yesterday was gone, we had reservations at another park on the south side of town. We arrived here this morning at about 10:30 and got in our sites. Janice and Dean had to move once because of faulty electric, but we got settled in and are enjoying this place much more than the other. The campground here had smoked BBQ ribs for dinner tonight, so we three couples got tickets and all went down there. It was very good and when we walked back, we all gathered outside Mickey and Patti's trailer and talked and planned the next couple days. Tomorrow we are going to visit the Alamo, then go down to the Riverwalk and maybe take a boat ride. I am including a picture of our rig, Phaeton Place, that Patti took while we were on the road. We spent 2 nights in Deming, New Mexico, after leaving Tucson. 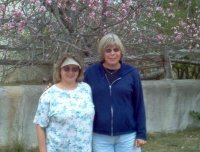 We met up there with friends Mickey and Patti and spent a few hours looking over a couple state parks near Deming. 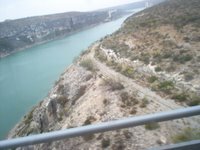 Saw some beautiful sites, hills, valleys, etc. 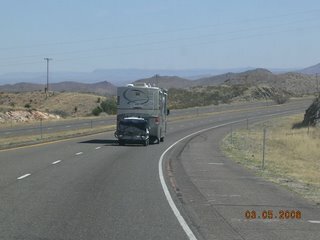 We left Deming and headed east on I-10 stopping for the night in Van Horn, Texas. There we decided to depart from the usual route across I-10 and take the scenic route down US 90 toward Del Rio. We left yesterday morning and embarked on a journey that at first didn't hold much in scenery, but as the miles went by, we started to see more hills. Even though the landscape was scrub, there were several species of animals we saw. We saw a bobcat walking alongside the road. As we approached, he turned and I got a good look at his face. We saw the usual hawks, but we also saw a lot of antelope. Then my favorite, the javelina. They are really cute when they get spooked because they try to run so fast on their short little straight legs and their hair looks like it stands straight up. Hah. We saw a couple of them. We stopped for the night in Sanderson, Texas, which really has not much claim to fame although the campground was adequate. A couple owns it and is building an adobe house on the grounds. The house was really interesting looking with a "dogtrot" separating the main house from the bedroom. They are building it much like a cabin, with wood plank floors, exposed ceilings, etc. The adobe block were 16 inches, serving as the outer and inner walls. Porches ran all the way around the house. It was really neat and they were very gracious to show us around. today which was a beautiful aqua color and then crossed over part of Lake Amistead, which borders the US and Mexico. The lake was beautiful. It was nice to see water again. We are here for a couple days. Our goal is to see the Alamo Village. It is the Village and replica of the Alamo that John Wayne had built for his 1960 movie, The Alamo. We are staying in a campground at Fort Clark, which is a decommissioned fort with a lot of buildings here still intact. They have in most cases been restored and used for other things, but when you drive through, you certainly get the feel of an old military fort here. 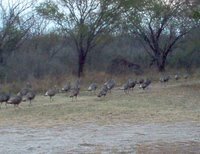 We see a lot of wild turkey in the camp. They wander through at will and we are told there are a lot of deer in the camp at night. We are experiencing a lot of wind. We may decide to stay an extra day as we have no desire to be on the road with really strong winds. We shall see. Well, we have been there and gone. . . Tucson that is. We arrived Wednesday and set up camp at the Pima County Fairgrounds. Not a bad place to camp. Full hookups for $17. Everything else in town was in the $30+ range and since location wasn't real important to us, we managed quite well. The fairgrounds is on the far east side of town, so it made leaving there easy. 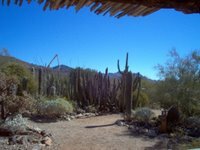 We only stayed there for 2 nights, so we didn't get to see much, but we went to the west side over the mountain and visited the Sonoran Desert Museum. It is part zoo, part museum. . . and a living desert museum. They had some displays behind glass, like the reptiles and spiders, etc., which was fine with me. Although it would be highly possible to see those in the wild at this location as well. You take off hiking along a path and things are marked. It is very well laid out, easy to follow, and a good source of information about life for plants and critters in the desert. We ended our visit there with the hummingbird aviary, which is a walk through area. Once the school kids left (wow, what a screaming bunch) the hummingbirds ventured out from their hiding places and put on a fascinating display. One was nesting. After leaving there, we drove next door to the parking lot of the Old Tucson studios. 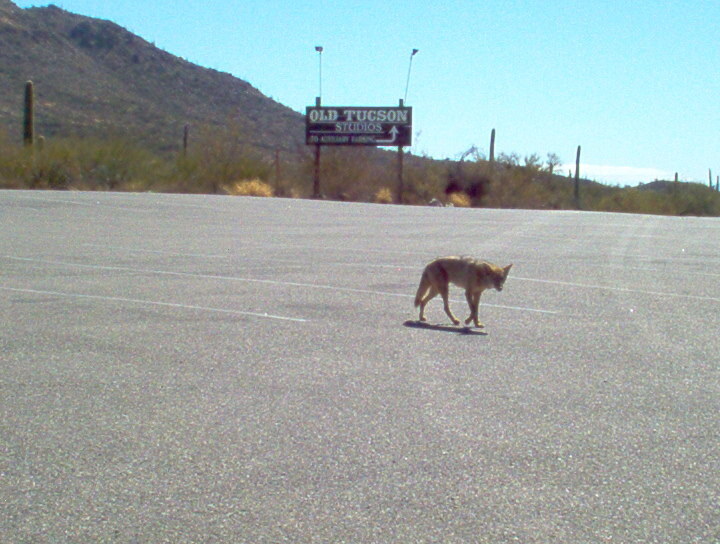 We didn't have time to take in the activities, but we did get to see a coyote. 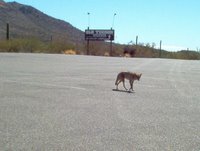 He was in the nearly empty parking lot just strolling around. Imagine he might be used to handouts, although we didn't give him any. We just took some pictures. He didn't let the car get too close. Friday morning we left Tucson and drove east on I-10. We arrived in Deming, New Mexico, around 1:30. We are parked right behind Mickey and Patti and got an invite for supper. Doesn't get any better than that! We had English Muffin pizzas and they were delicious. Thanks Mickey and Patti. We got all set up at this Escapees park. It is a nice easy park to navigate and we frequently use it when we are passing through. There isn't a lot to do around here, at least, not that we have found in the immediate area. But we are here for a couple days to regroup before heading east. 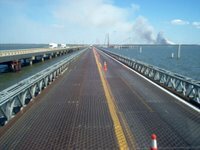 Our goal in the next week or so is to arrive in Corpus Christi and spend some time there. Patti needs to see water again and we are moseying over toward lower Alabama for the rally the end of the month.